New York City resident Jason Green wanted good local produce available in his city on a year-round basis. 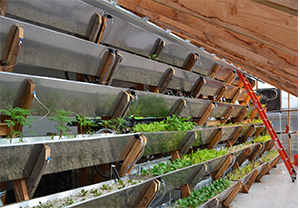 Concluding that other New Yorkers wanted the same thing, he addressed this insufficiency with aquaponics. Desiring a more intimate relationship with food, Green was already gardening in his apartment window box. But in order to grow local produce year-round in New York City, he knew that a new sort of infrastructure was needed. So Green, along with co-founders Ben Silverman and Matt La Rosa, founded Edenworks, which utilizes vertically-terraced, closed loop, modular aquaponic ecosystems. In March 2013 Edenworks started its first farm on 800 square feet of rooftop space in Brooklyn, selling to Adalya, a Mediterranean restaurant in the city. This 800-square foot space serves as a prototype, with an emphasis on research, development and promotion. Edenworks’ next farm will be quite a bit larger—8,000 square feet to be exact, on the rooftop of another Brooklyn building. Green says Edenworks will sell all of its produce due to demand from the building’s 5,000 residents (those who are interested will receive produce through weekly subscriptions). During preparation for its next rooftop operation (for which it is still raising venture capital), Edenworks is still growing and conducting research on its first 800-square foot facility, which is home to 20 different kinds of crops. These include chard, bok choy, lettuce, sage, rosemary, chives, mint, radishes, pea shoots, basil, marigold greens, tomatoes, tomatillos, peppers and carrots. All of these vegetables are grown as a way to test to see how well they fare in an aquaponics medium—the goal is to grow a large variety of culinary vegetables via aquaponics on one rooftop. What distinguishes Edenworks are its Farmstacks. Each individual aquaponics system has a microclimate tailored to what kind of plant it supports, and also provides a home for fish (tilapia, catfish and/or crawfish). Additionally, the Farmstacks contain special areas for growing mushrooms, which consume excess oxygen and produce carbon dioxide. Taking sustainability even further are compost bins inside each Farmstack, where black soldier fly larvae feast on leftover plant debris. Due to regulatory constraints, Edenworks currently only sells its fish wholesale. Selling fish directly to consumers (which Edenworks plans to do eventually) requires a different class of permit. Green says the challenges which Edenworks has faced in getting up-and-running have also provided the most opportunities. Mainly this has centered on common attitudes toward food production. Consequently, agriculture has not been an exciting place for venture capitalists. “We’ve had to overcome this by creating our own momentum,” Green says. But venture capitalists such as Google’s Erik Schmidt and his Farm2050 (a collective that supports agriculture technology startups) are becoming more common, thus benefiting companies like Edenworks. Green and his co-founders attracted like-minded visionaries after launching Edenworks, as their employees found them, rather than the other way around. “Everyone on our team is connected to food,” says Green, giving an example of Edenworks’ software developer who founded the botany club at New York University Polytechnic School of Engineering. As Edenworks grows, Green knows it’s crucial to keep finding and retaining top talent.